The SEMA show is renowned for its creative vehicle builds, some conservative and some completely outlandish. Either way, it show the creativity of the car building community and none more so than American Racing Headers who have decided to take a Toyota Prius and drop a Hellcat engine into the thing, thus producing the the PriuSRT8! I never thought I’d be adding a Toyota Prius to this website, but when it houses a hellcat engine things get interesting. I just wonder what the Eco Evangelist crew think of this ride. The next thing is to see this 700hp ride do a few laps and I think the only thing missing is a nice healthy blower poking through the hood. I especially like the unique logo they have on the car. Does remind you of anything?!? Also, is this the start of a hellcat hybrid movement?? If you want to find out more about this ride, visit their build page here. 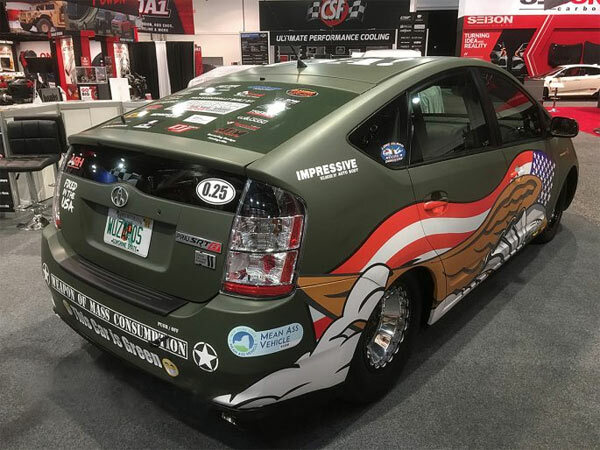 Related ItemsSEMA 2017 - Hellcat Powered Prius?!! ?